COULD IT BE TRUE? T.B. JOSHUA N10 MILLION!! What a life…? What a world…? What a love…? In this world where everything seems uncertain only one thing is definite, that is love beyond measure. Love that is held when it is unspoken, seen when it is invisible and felt even without touching it. This is the kind of unconditional and absolute love Prophet T.B. Joshua indeed has for the world. He has clearly practiced what is written in the word of God, “Love your neighbors as yourself”, your neighbors may be your enemy and those that do not share the same faith with you, the scripture says, “love them all”. 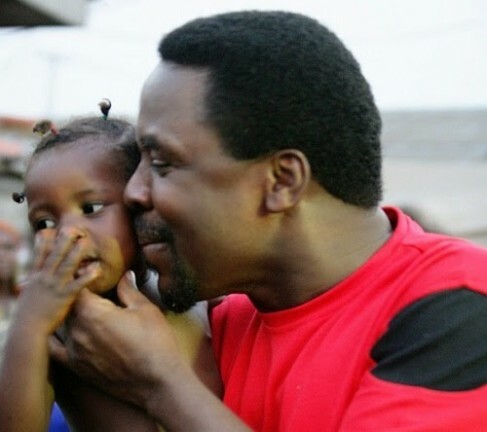 Notwithstanding the present challenges his Ministry has been put through, the renowned and most criticized Nigerian Prophet, T.B Joshua, who’s Ministry has being under great threat and persecution still lost no time in affecting the lives of those who are in need with his charitable works. It indeed struck my heart to precisely respond at this junction following the striking front page of the Nigeria Vanguard Newspaper and other online News sites that the Prophet donated the sum of N10million Naira to the Internally Displaced Persons (IDPs) in Kuchingoro Camp, Abuja. This shows that to a man of faith no matter what constitutes an obstacle, he can never be stopped. Especially, citing the act of injustice in the recently concluded coronal inquest, one would expect Prophet T.B Joshua to be unconcerned with anything that has to do with his nation, but that was not the case. Prophet T.B Joshua has continued to demonstrate that he still has a heart for his people. This single action from the Prophet, confirms that he is not only characterized with extraordinary charisma, but with the utmost perfect example of love among other Church leaders of his caliber. This selfless action clearly shows that Prophet TB Joshua is not ruled by his situation; he knows that his enemies are not flesh and blood, but supernatural forces. Little wonder his Ministry continues to blossom despite the situation that has come across his way, because he acknowledged the simple fact that the secret of blessings is in giving. The Prophet Just demonstrated to us that as a Christian, we should be thankful to God, even if there is nothing to be thankful about (Daniel6:1-end). When we find ourselves in a critical situation, we should learn not to focus on the situation, but to make the best out of it. That shows that our hard times are not meant to impair us, but to improve us. In the midst of the persecution, hatred, name calling, insult and injustice, Prophet T.B Joshua is still showing love to his nation, which is an attribute of a genuine man of God. Just like as Jesus Christ rebuked Peter when he chopped off the ear of one of the soldiers that came to arrest Him and still at that spot performed a miracle by restoring the ear of the soldier. It is said that a true Prophet is not honored in his own town just like the case of Jesus Christ and some of His Apostles; they were unable or did little in their own town. Today, leaders of different foreign nations are calling on Prophet T.B Joshua to come and reside in their country to establish his Ministry there. But the reverse is the case in Nigeria his home; they have little or no value for what they possess. They are misusing the privilege and opportunity of this wonderful gift raised among them by God to liberate the nation and the world at large from tedious circumstances. Again, let us examine this action of Prophet T.B Joshua donating the sum of N10million Naira, to the Internally Displaced Persons (IDPs) in Kuchingoro Camp, Abuja. ‘Humanly’, imagine if you where the one passing through the same hatred and injustice the Prophet is experiencing from his people, would you still be concerned about what happens to the nation that is against you? This clearly shows that the Prophet works by faith and not by sight and this again has exposed the earnest genuineness of his power and faith in God. Full Video Jim Iyke At TB Joshua Church – Live! For the latest updates on TB Joshua Subscribe Now! In consideration of the way and manner the internet has become practically flooded with diverse views on TB Joshua and SCOAN, it would be safe to assume that those looking for the truth about TB Joshua on the web would be in sort of a dilemma, as finding just about the correct information on TB Joshua online would be a herculean task, much like finding a needle in a hay sack, in all we would encourage readers to subject whatever information they come across to confirmation which is one of the reasons for this site. we’re poised to go the extra-mile to sequentially verify the on going rumors and allegations against TB Joshua. We promise to continually update our readers with the latest information have on TB Joshua and SCOAN, as well as the ongoing debate about him on the internet. Do subscribe and be the first to get the latest updates on these issues.